The seventh edition of the BBC’s popular record book—now updated to include the thrilling events of the 2016 season! Focused exclusively on the most glamorous of all racing competitions, this fan favorite highlights the great battles for the World Drivers’ Championship and the Constructors’ Cup since they began in the 1950s. 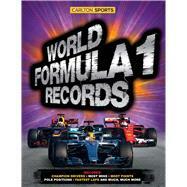 Along with 380 fantastic action photographs, World Formula 1 Records features hundreds of stories, statistics, lists, and tables covering the legendary drivers, teams, and tracks. Bruce Jones is one of the best-known faces and voices in motor racing and a pit-lane regular at all of the world’s Formula 1 circuits. A former editor of Autosport magazine, he has written numerous books including World Motorsport Records, 65 Years of the Formula One Championship, Grand Prix Yesterday & Today, The Treasures of Formula One, and The Complete Encyclopedia of Formula One (all published by Carlton). He lives in Wiltshire, England.